Han Kuo-yu shared a message to social media on Saturday addressing the Kuomintang (KMT) Party’s attempts to coerce him into the 2020 Taiwan presidential election. Declaring that he has not yet fulfilled his obligations to voters in Kaohsiung, Han publically rejected the possibility of running for president in 2020, dashing the hopes of KMT party chairman Wu Den-yih. In his statement, Han Kuo-yu said that work remains to be done in Kaohsiung. “Over the next four years, I will show everyone my determination and commitment to fulfilling the promise I have made,” reports Apple Daily. Han also made a statement endorsing the former President of the Legislative Yuan, Wang Jin-pyng (王金平), as a strong candidate for the KMT nomination. Han has previously stated that he has no interest in joining the presidential race. 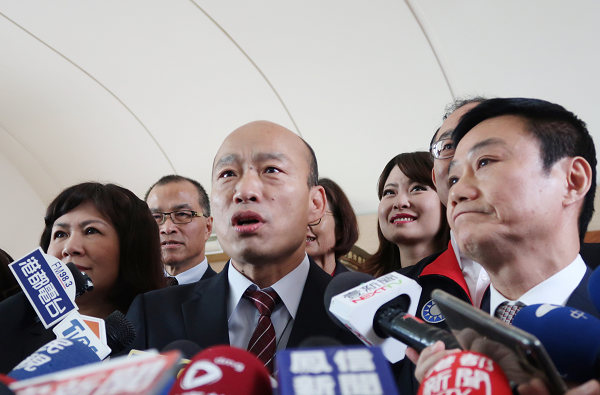 However, in recent weeks Chairman Wu has been insistent that the KMT should nominate its most popular member to challenge the Democratic Progressive Party (DPP) in 2020. Wu’s consistent calls for Han to abandon his office in Kaohsiung, have energized the mayor’s supporters across Taiwan, and also sown discord among KMT hopefuls like Wang Jin-pyng and former New Taipei Mayor, Eric Chu (朱立倫). Now that Han has unequivocally rejected a presidential bid, KMT Chairman Wu is preparing to consult with the party’s central committee, along with Han, Chu. and Wang, to determine the best path forward for the party, reports Apple Daily.